Did you know that snails can sleep up to 3 years. Snails are one of the earliest known types of animals in the world. They evolved more than 600 million years ago. The biggest snail recorded weighed only 2 pounds and was 15 inches long. 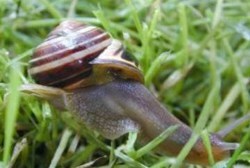 Snails are very slow moving creatures and most people find them to be boring. As snails move they leave behind some slime.